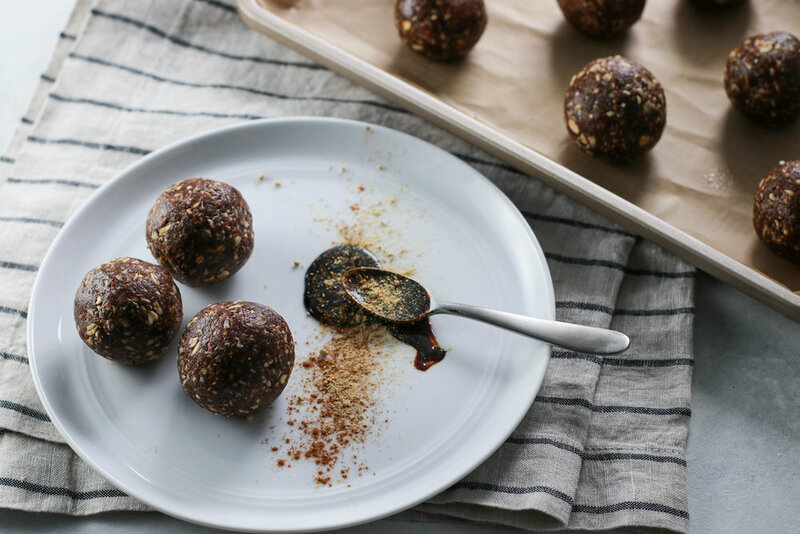 Gingersnap Molasses Energy Bites — Erin Parekh | Live Well, Simply. I'm not a baker. I can easily follow a recipe and make a cake or cookies, but coming up with baked good recipes on my own just isn't my thing. However, energy bites and other no-bake sweets are totally up my alley! They're much more like cooking - throw ingredients together without really having to measure and then tweak until you end up with something you love. These Gingersnap Molasses Energy Bites are my take on traditional gingerbread cookies. Because this time of year have to have cookies! I'm planning on making them for holiday gift giving. The spices in combination with the molasses are spot on Christmas flavors. You could even press out the dough on parchment paper and cut out little gingerbread people! In a food processor, pulse almonds until ground into a coarse flour. Add dates, almond butter, molasses, and vanilla - blend until a smooth paste forms. Add rolled oats, coconut flakes, flax meal, cinnamon, ginger, cloves, and salt. Pulse again until well combined. The mixture will be slightly sticky. Chill mixture for at least 30 minutes, until firm. Then roll into rounded tablespoon sized balls. These bites will keep in the fridge for at least a week, or well sealed in the freezer for several months. Tip: If dates are hard, soak them in hot water for 5-minutes, then drain well.